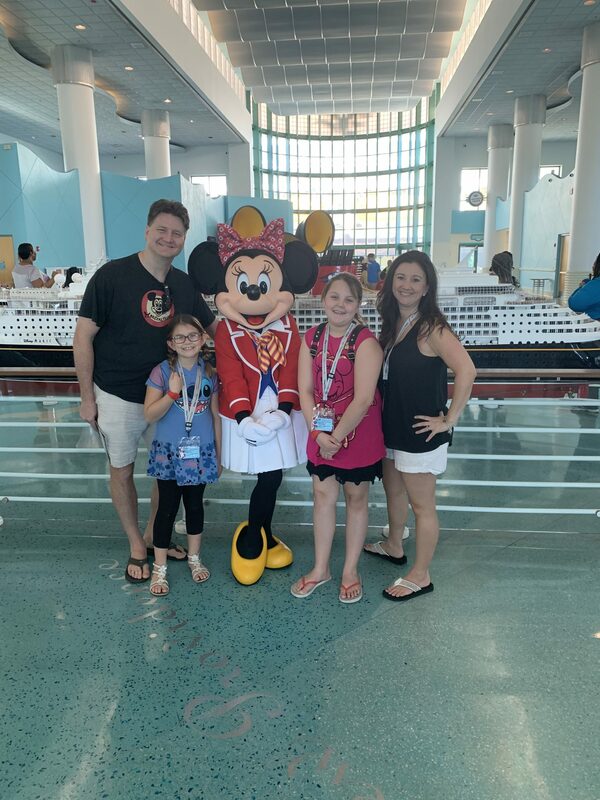 Disney Cruise Line – How to plan your Disney Cruise Line vacation! How many ships does Disney have? Where does Disney Cruise sail? 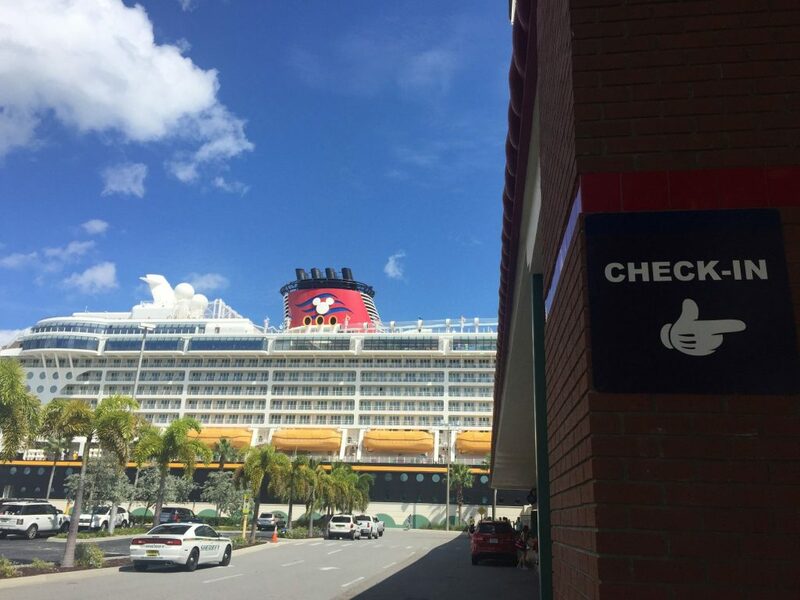 What ports does Disney Cruise Line Sail out of? 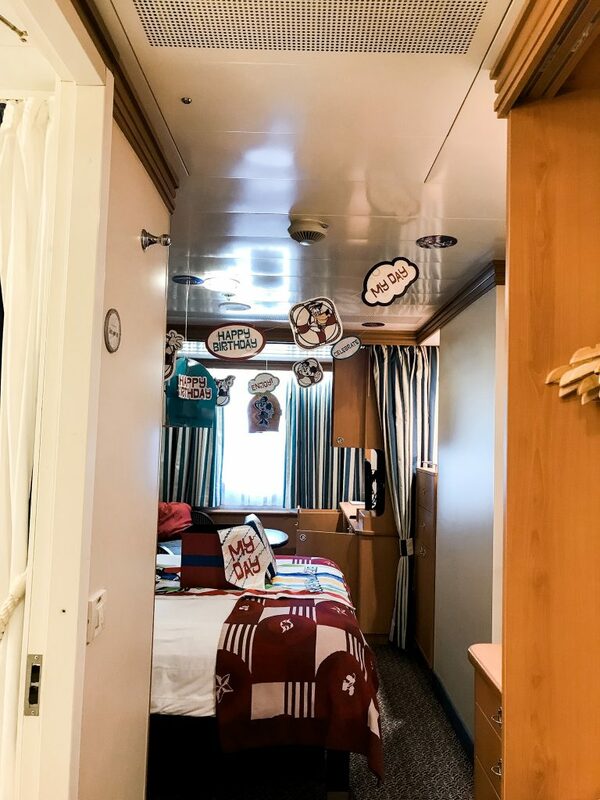 What types of Staterooms does Disney Cruise Line have? Is a Verandah worth the extra money? Will I spend that much time in my room? Is Concierge Level Worth it? 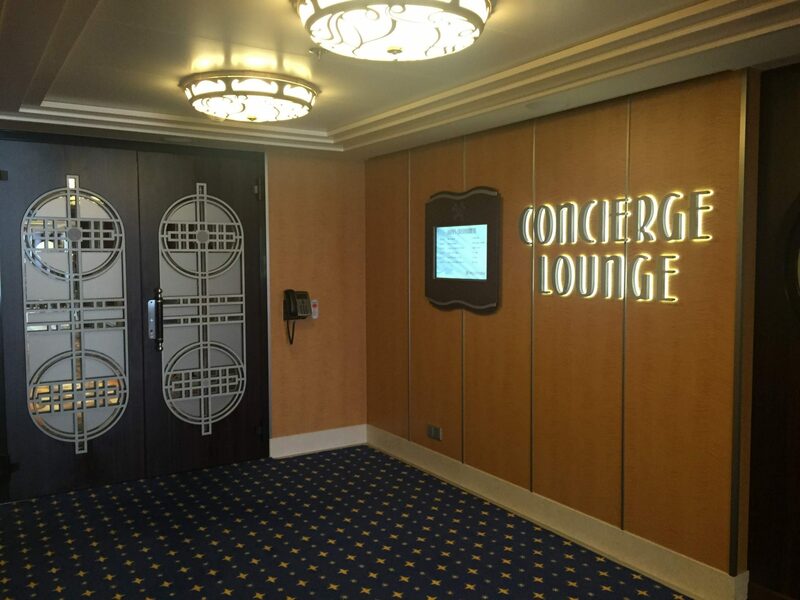 Where are concierge rooms located on the ship? Where do I stay before sailing? How do I get to the Disney Cruise ship? What do we do once we’re on board the Cruise Ship? Is the Muster Drill Mandatory? What Happens at the Sail Away Party? I love to cruise! Who am I kidding? I love to vacation! But cruising is one of my favorite kinds of vacations because of the ease of it all. You can relax or be busy, that’s totally up to you, and there is something for everyone! Cruising is great for multi-generational trips or family reunions! I’ve sailed with many different cruise lines, but Disney is my favorite. 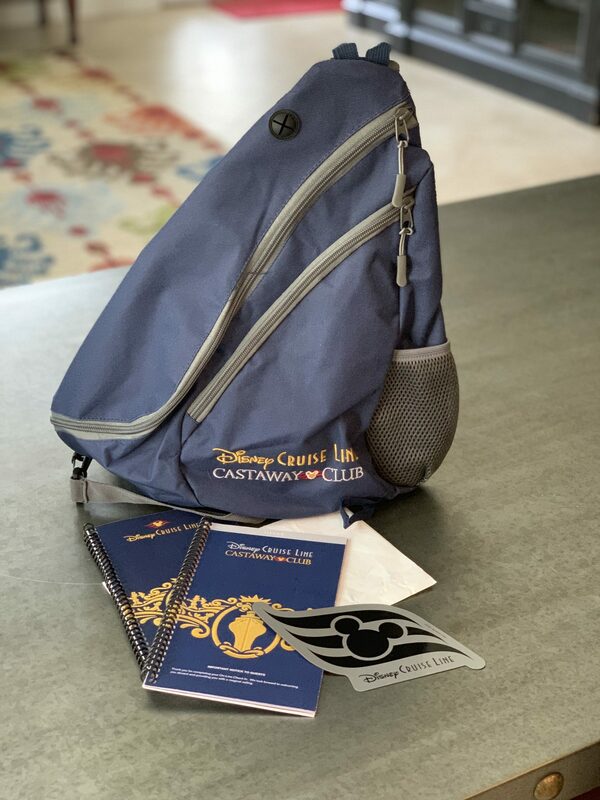 In part, because of my heart for Disney but also because of the attention to detail you’ll find in every aspect of your cruise. The ships themselves are stunningly gorgeous with an old school nostalgia, and the Crew Members are top notch. You’ll find every bit of Disney magic when sailing with Disney Cruise Line. Go ahead, add it to your bucket list! You won’t regret it! 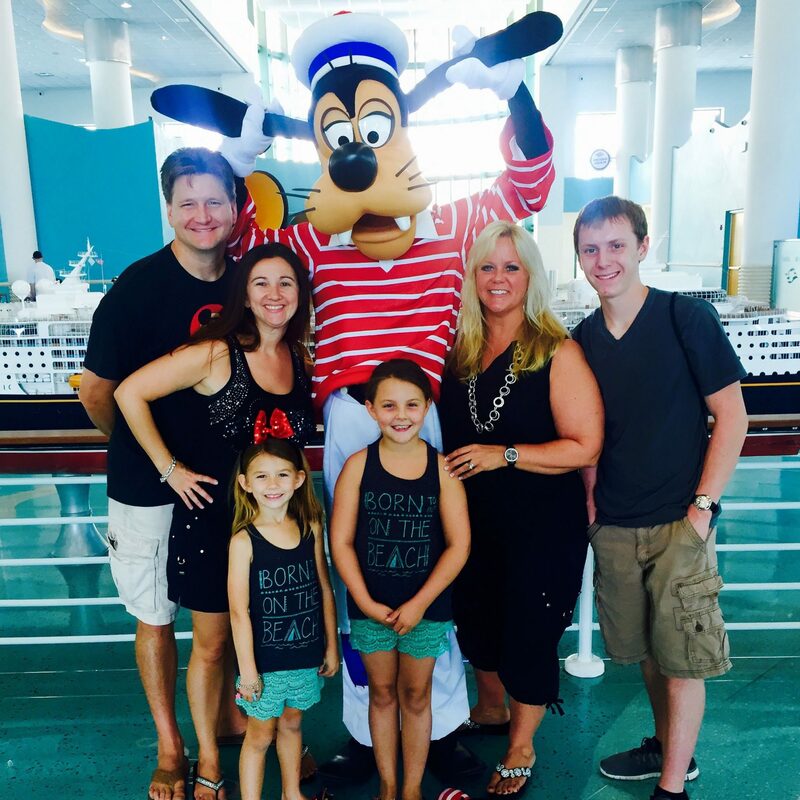 Now on to the nitty gritty and how to best choose the cruise for your family! Disney Crusie Line currently has four ships sailing around the world. The Disney Magic, Disney Wonder, Disney Dream, and Disney Fantasy. 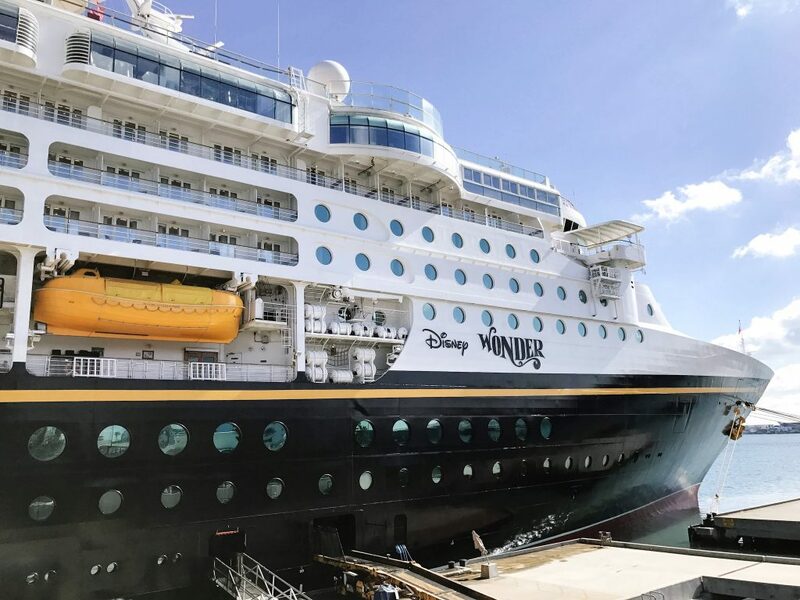 Disney Cruise Line has four new ships arriving in port in 2020, 2021, 2022 and 2024. No announcements on their names or home ports and itineraries. I’m guessing we’ll see them in New York, California, and Texas as those are always popular port departures during the few months the current ships sail from these ports each year. The Disney Fantasy and Disney Dream are sister ships meaning they are the same size and class of ship and very similar in styling. There are very few differences between the ships and their offerings, and those things are not necessarily deciding factors when choosing which ship to sail on. The Disney Fantasy currently departs each Saturday on an alternating Eastern and Western Caribbean itinerary for seven nights. The Disney Dream currently sails a three night and four-night alternating Bahamian itinerary. The three-night sailing departs on Fridays and returns to Port Canaveral on Monday. The four-night sailing departs on Mondays and returns to Port Canaveral on Fridays. They typically make a stop in Nassau, Bahamas, and Cocoa Cay (pronounced Key) a very popular stop when sailing with Disney. On the four night, itinerary guests can also expect to have a day at sea. 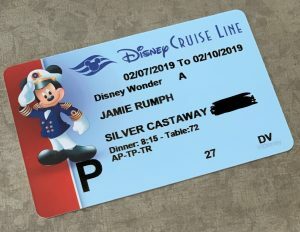 With the release of Disney Cruise Lines 2020 itineraries the sailing lengths have been changed up a bit from the standards above. You can see all Disney Cruise sailings here. The Disney Wonder and Disney Magic are sister ships as well. 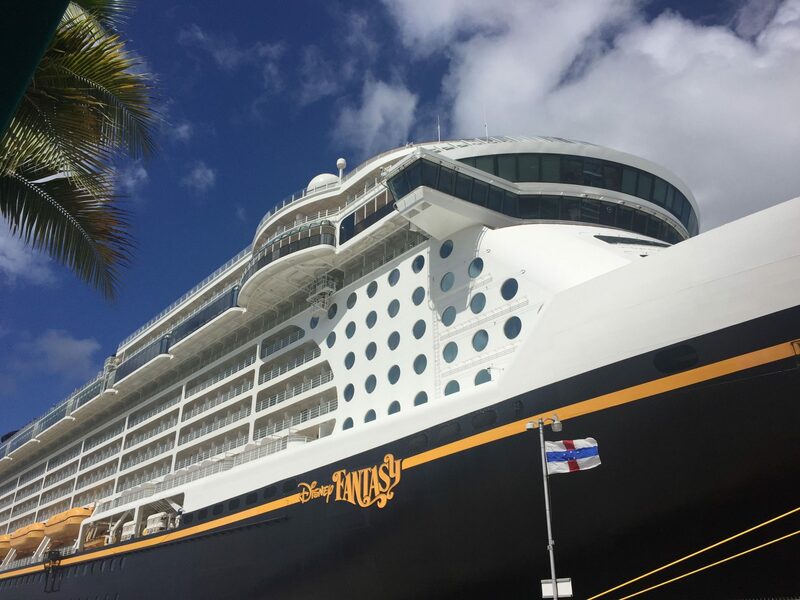 They are the original Disney Cruise Line ships in service and smaller than the Disney Fantasy and Dream but not lacking in style and amenities. 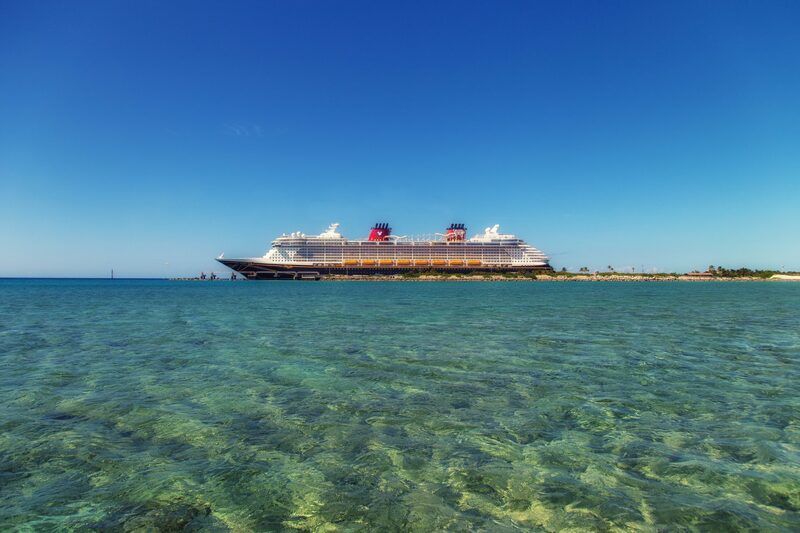 The Disney Wonder and Disney Magic move ports throughout the year departing from European, Alaskan, California, Mexico, New York, and New Orleans in 2020. These two smaller ships also sail out of Port Canaveral and Miami for some sailings each year. 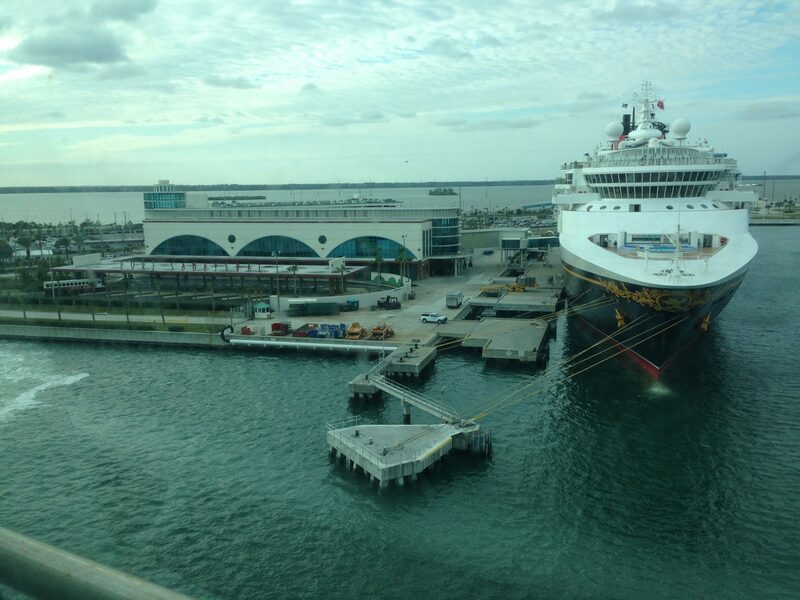 The Disney Dream and Disney Fantasy sail out of Port Canaveral (Orlando) all year long. 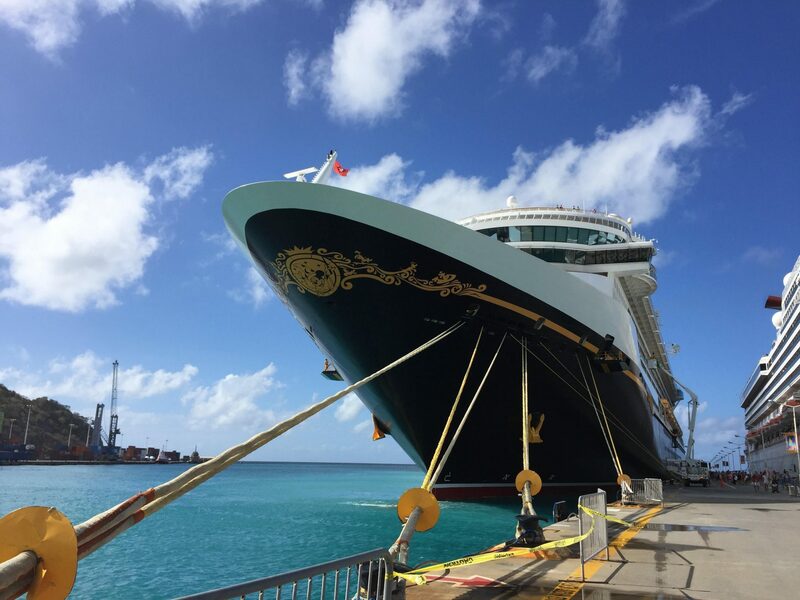 The Disney Magic and Disney Wonder change ports throughout the year. In the summer months, the Disney Wonder sails through Alaska and the Disney Magic is in Europe with various itineraries on each end of those sailings. Disney Cruise Line sails out of Port Canaveral year round. The remaining ports offered limited sailings throughout the year. All Disney Cruise suites are concierge level. The Walt Suite and the Roy Suite are the two largest cabins on each Disney ship. There is one of each on all four of the ships. They each sleep five people on the Disney Dream and Disney Fantasy. On the Disney Magic and Disney Wonder, they accommodate seven guests. They are located on deck 12 of the Disney Dream and the Disney Fantasy at the back of the ship. You can reserve them both along with a one bedroom suite, and they will all connect to accommodate 15 guests. Talk about a great private party! 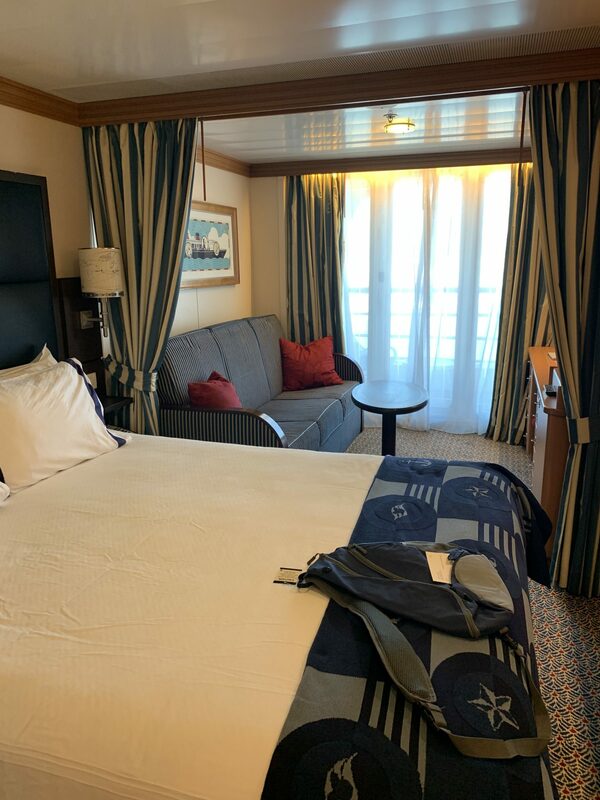 2 Bedroom suites are only on the Disney Wonder and Disney Magic cruise ships. They are on deck eight forward, and there are two on each ship. They accommodate seven guests each. There are one bedroom suites on all four of the ships. They accommodate 4 to 5 people in each suite and can be booked with the Royal Suites that have connecting doors to accommodate larger parties or families and friends traveling together! These rooms have the same layout as other verandah staterooms but have concierge level accommodations and a warmer color palette. Verandah staterooms have small balconies with floor to ceiling windows with ocean views. The doors are hefty and lock at the top so that children are not able to get out on the verandah without the help of an adult. Some verandahs have open railing from the floor to railing height. 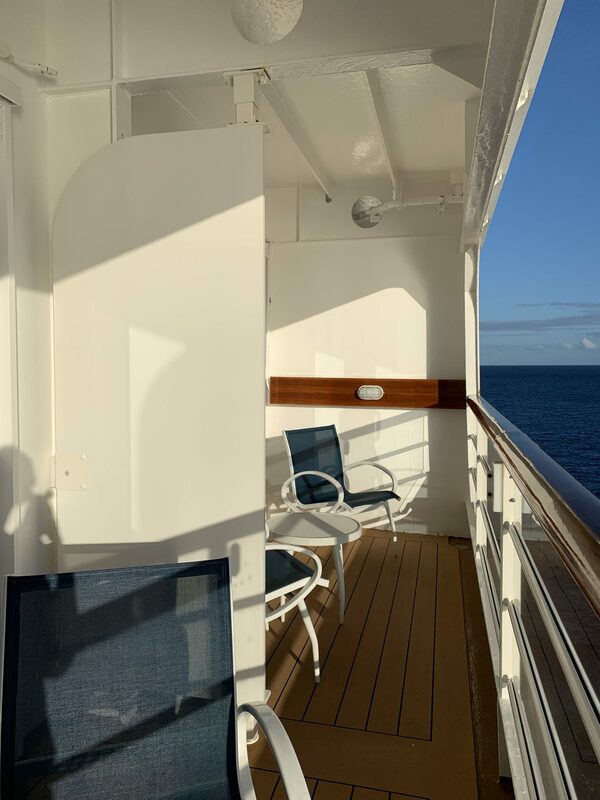 Other verandah staterooms have a white wall half way up. It is a white steel wall that is part of the ships overall structure. The room shown below sleeps 3. The sofa is a convertible bed that is twin size. 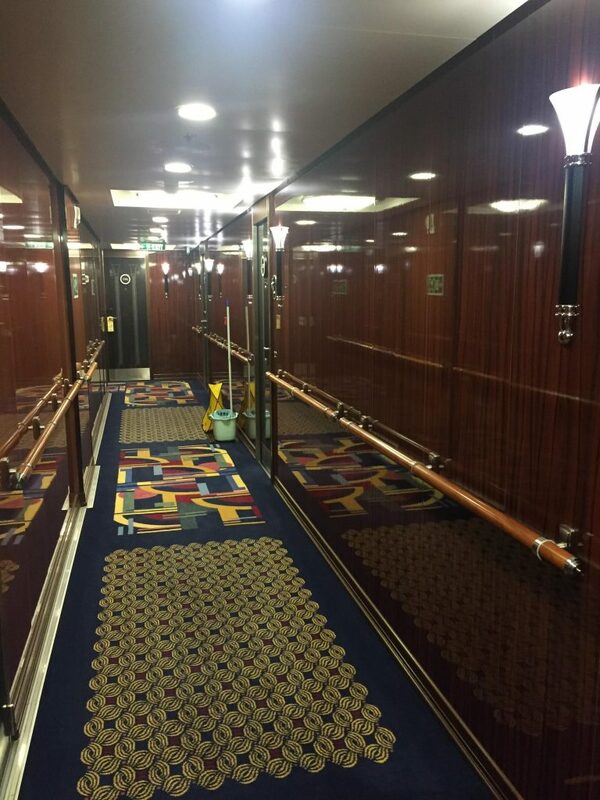 Other verandah staterooms can sleep 4 or 5 and have a pull-down bed from the ceiling and wall. 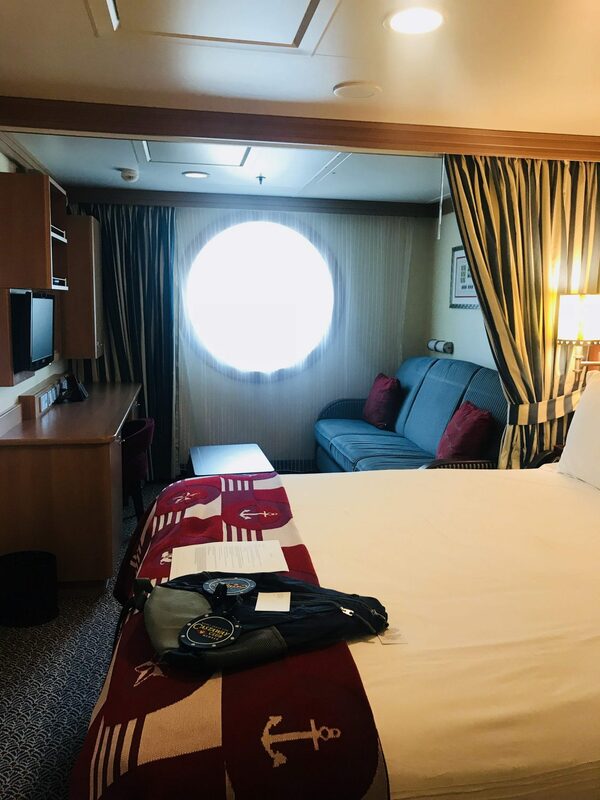 Oceanview Staterooms have one or two circle porthole windows that do not open to the outside. It’s excellent for natural light, but the window does not function. The room shown here sleeps 4. The sofa is a convertible bed twin size, and you can see the rectangle outline over the sofa that is the pull-down bed that is like a bunk bed over the sofa. An interior room does not have a window or exterior view. 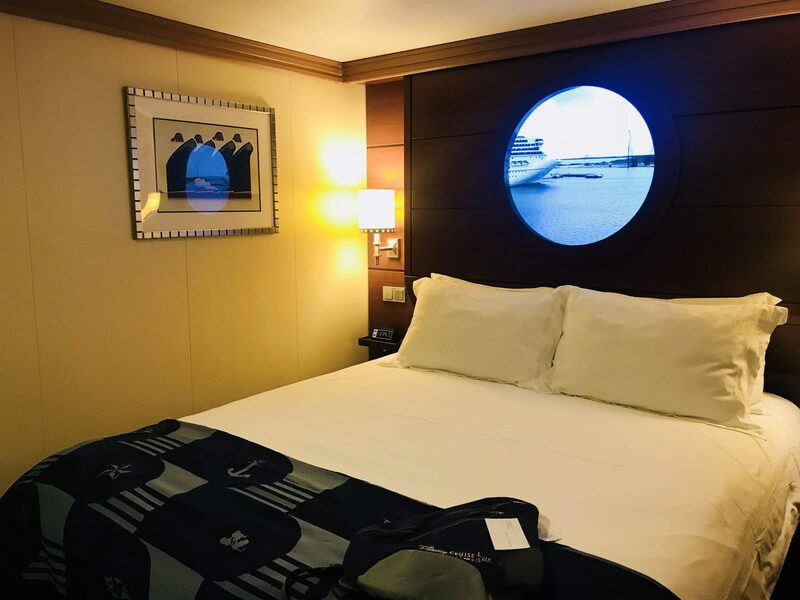 Each of Disney’s inside staterooms has a magical porthole that is a screen built into the wall. Sometimes you’ll see views like what’s shown above while in port other times you’ll see Mickey and friends snorkeling by. The magical porthole can be turned off at any time. 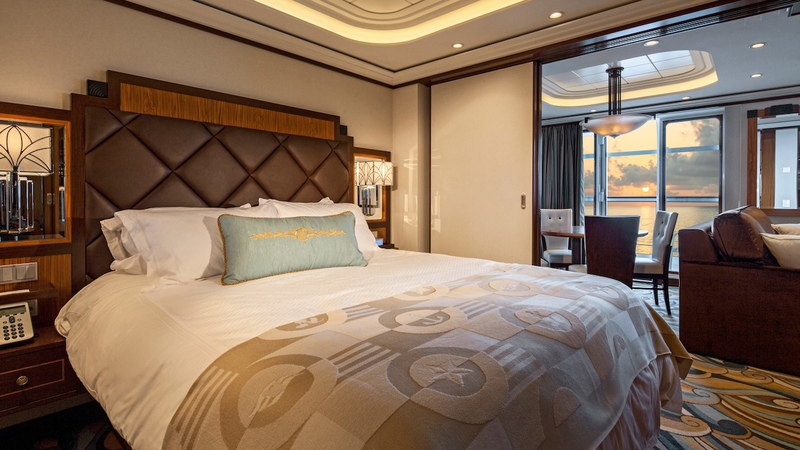 This inside stateroom only sleeps two, but there are interior staterooms that will accommodate 3, 4 and five guests. In my opinion, yes. It is so lovely to have your own space in the morning and evenings to sit on your verandah and watch the ocean go by. We spend a fair amount of time on our verandah both in the morning at night after the kids have gone to bed but my favorite time to sit on the verandah is in the late afternoon after we have returned from our day’s excursion. It’s so peaceful to sit outside and rest before dinner and the evening show. On itineraries with more to see like the Panama Canal or Alaska, the verandah is without a doubt worth the splurge. 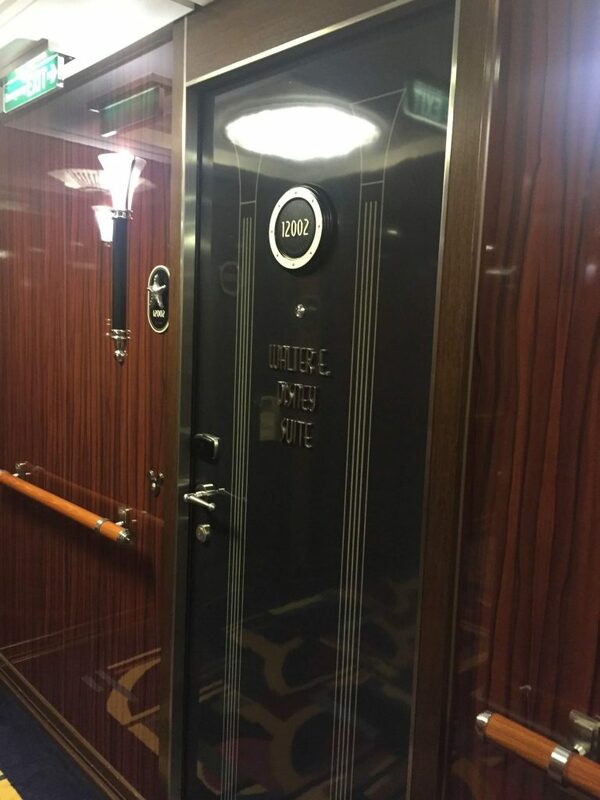 *Tip* – Before going to bed each evening hang your room service tag on your door, and fresh coffee will be delivered to your stateroom the next morning. Then you can have coffee on the verandah before ever leaving your stateroom. Yes and no. That’s a somewhat complicated question. It is left up to you how much time you’ll spend in your room, but you will spend enough time in your room! I am a “go, go, go” experience it all kind of traveler. I want to see everything! That being said, I also need some time to sit and unwind. This is when I love the verandah. It means I’m still getting to experience the outdoors and vacation and rest at the same time. All of that being said, I have and still do, sometimes sail in an inside stateroom. Sometimes you need to get on the “boat,” and the price determines what you can and can’t do! A resounding yes! 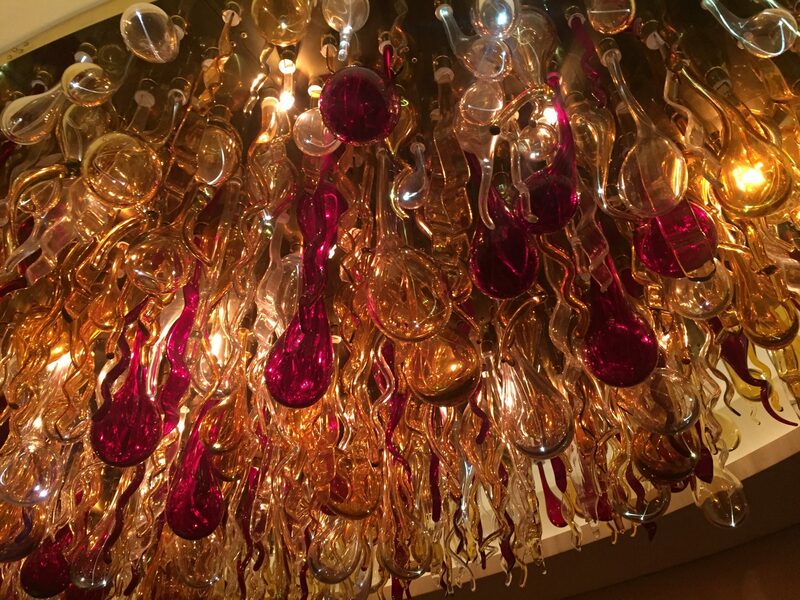 When you sail concierge level, you’ll experience a few magical extras. Online check-in at 120 days before sailing. The concierge team will book your excursions for you at 120 days before sailing. You will send them an email of your desires 125 days prior, and they will magically be reserved for you on the morning excursion booking opens. The opportunity to book a very popular Cabana on Castaway Cay, Disney’s private island. If you want a cabana, you must stay concierge level. They are sold out well before the general sailing public has the opportunity to book one. Preferred check-in at the port. Which means no lines to wait in. Sail away party with the captain. Concierge level lounge and private deck. Unlimited beer, wine and specialty coffees in the concierge lounge. On the Disney Fantasy and Disney Dream, the concierge level rooms are located on decks 11 and 12 in a separate area from the other staterooms. 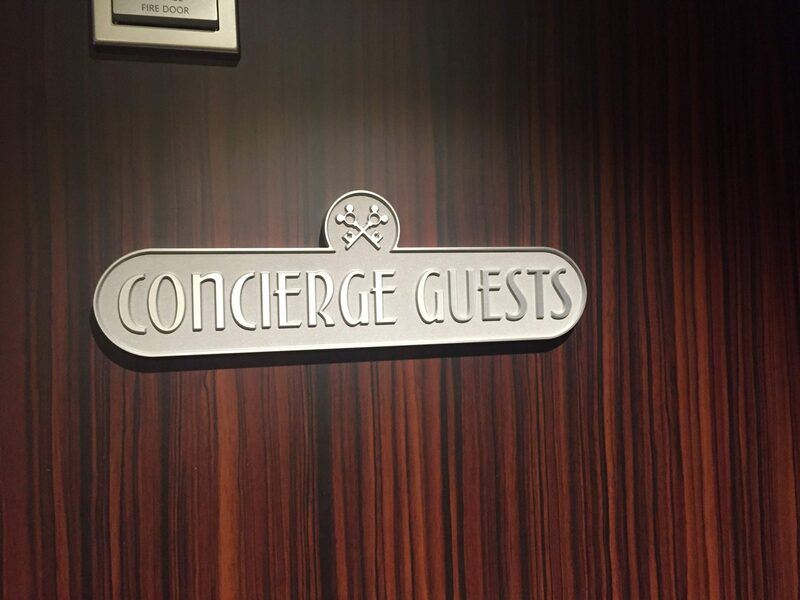 On the Disney Magic and Disney Wonder concierge level rooms are distributed among other staterooms on deck 8. Gratuity will be charged to your account. *Tip* – prepay your gratuities when you book your cruise to avoid the daily charge possibly going up. Nursery care for infants six months and older to age three not potty trained. You can bring on board two bottles of wine or one 6-pack of beer from the original departure port. All alcohol bought while on the cruise will be held until you return to your home port. You will receive your cruise booklet and luggage tags after your final payment date. If you don’t, it’s not a big deal. You don’t need the book, and the luggage tags can be printed at the curb at port check-in. If you want to rent a cabana on Castaway Cay, you need to sail concierge level. They are typically all reserved by the time general boarding guests can book them. Disney has rotational dining, and the wait staff will move with you. The dining schedule is given to you when you board the ship. Beach towels are provided in abundance on the ship. 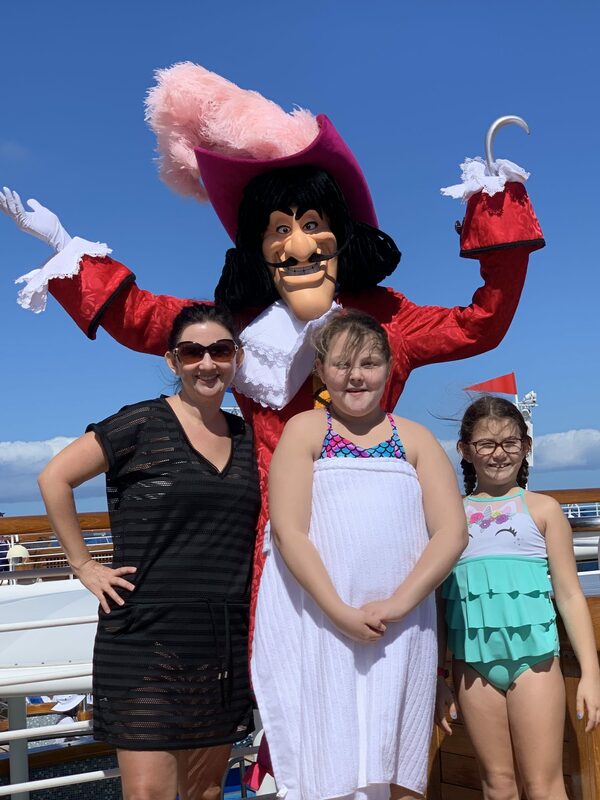 Book port adventures, onboard experiences like spa treatments, Bippity Boppity Boutique, specialty dining, Castaway Cay experiences including cabanas, princess meet and greets and character dining on select cruise itineraries. If you are staying Concierge Level, the concierge’s team will take care of all of your requests for you at 120 days before sailing. This is indeed the most fabulous service! You or your travel agent will send an email to the concierge team at 125 days earlier, and they automatically book the experiences you’d like for you. 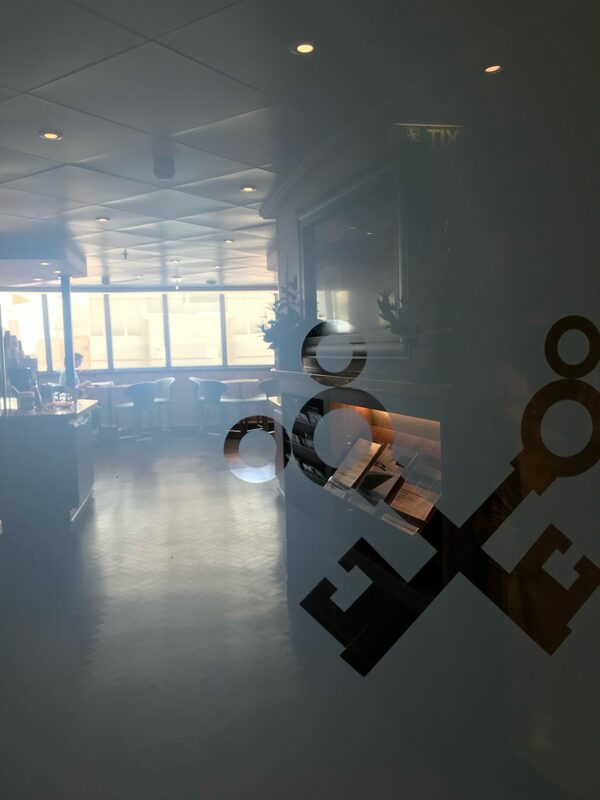 *TIP: Set your email to send to the concierge’s team at midnight at 125 days before ensure you get the experiences that are on your must do list! It is recommended that you arrive in your port city the day before your cruise departure. The ship will NOT wait on any guest who does not board the ship in time. Flight delays can cause you to miss your ship despite your best planning! 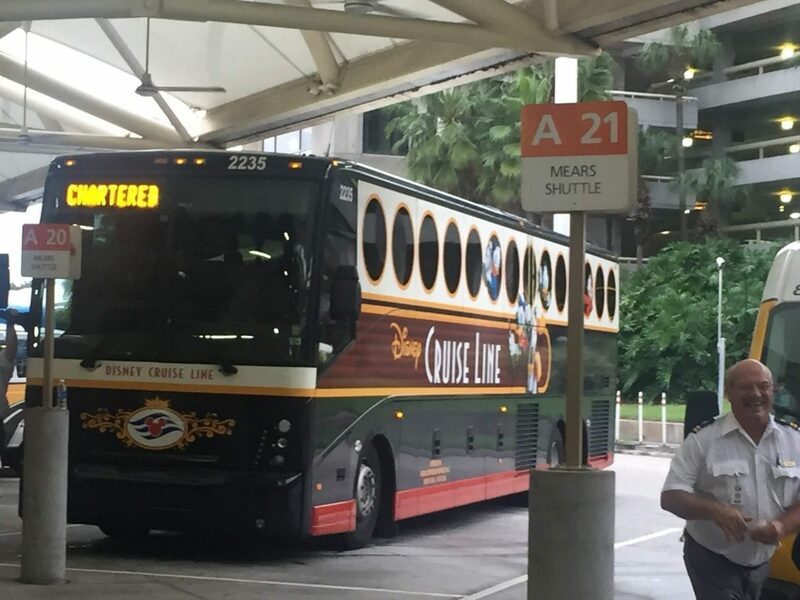 Disney Crusie Line offers paid transfers to the port from the Orlando airport or any Disney World Resort. In other port cities, Disney will provide transfers to a select few hotels from the airport and the hotel to the port the following day. When you return to port after your sailing, they will transfer you back to the airport. I prefer to Uber or take a private transfer to the port. It is typically more cost effective to do it this way. Only use Uber if you feel comfortable doing so. When you arrive at the port, bag handlers will meet you as you get out of the car. They will collect your bags and have them delivered to your room. You should have your bag tags attached to your bag at this point. If you do not have bag tags, they can print new ones for you at the curb. Your bags will take several hours before they’re delivered to your room. Make sure you have any necessities in your carry on bag including your swimsuit and sunscreen. When you do your online check-in, you will select a port arrival time. 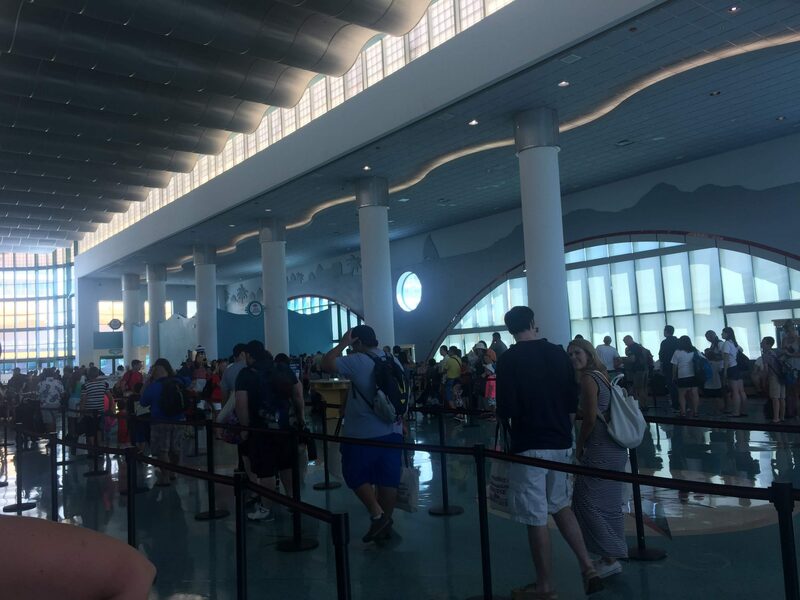 This is done to minimize the crowds and alleviate long wait times at check-in. Bag porters will collect your bags at the curb where you are dropped off. Bag tags can be printed there if you don’t have yours with you. The Key to the World card scans you on and off the ship, is your room key and your form of payment onboard. Cash and credit cards are not accepted on board the ship. Confirm your credit card information for your onboard account. Concierge guests have a private check-in area and lounge. 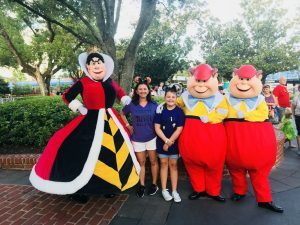 After checking in, you can have your picture taken with a couple of different characters. Only one character is out at a time, and they rotate through Mickey, Minnie, and Goofy. Then you’re welcome to board the ship! 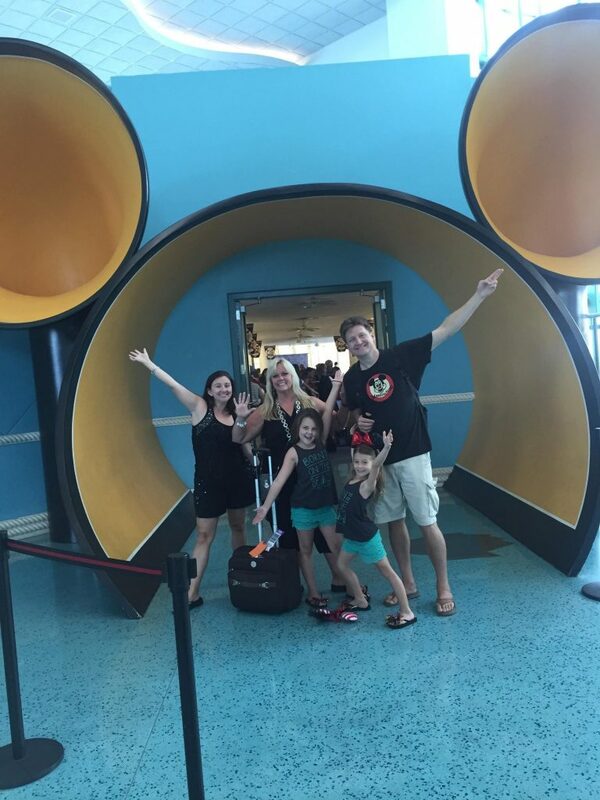 When it’s your turn to board the ship, you’ll pass through this magical Mickey! The magic officially begins just on the other side! You will have your picture taken before you get on board with the ship in the background. 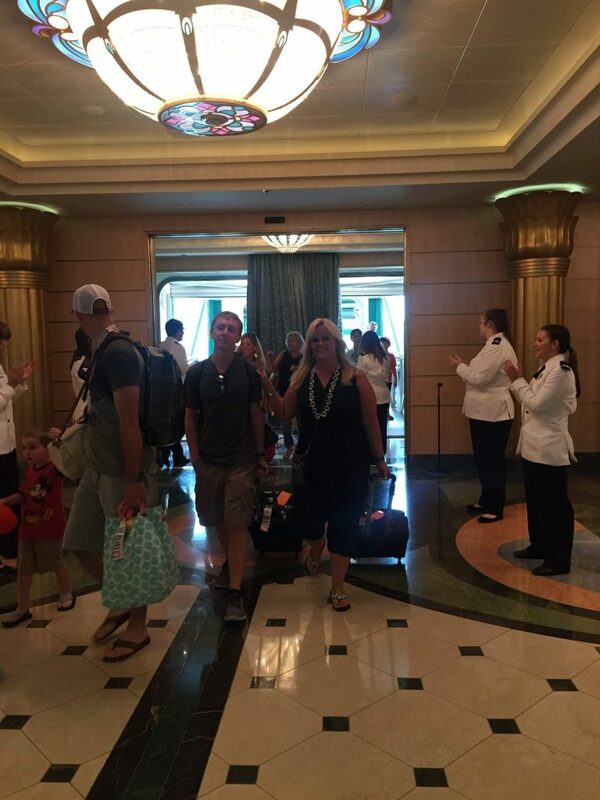 Cast Members announce and welcome each family on board the ship! 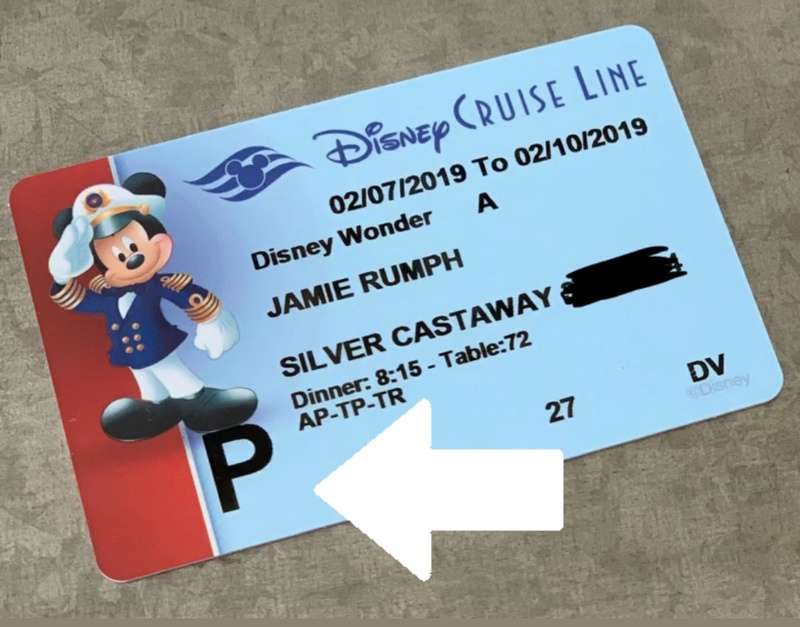 It’s these magical touches that make Disney Cruise Line so extra special! After you get onboard the ship, you’ll have access to Cabana’s (the buffet), and one sit down dining restaurant for lunch. The pools and splash zone are open as well. Guests will also be able to explore the ship including the open houses at the kid’s clubs and spa. It’s a great time to get acquainted with everything your home away from home has to offer! About an hour before the ship is scheduled to leave port, all guests will be required to report to their muster station. There will be several announcements, and all Cast Members will be directing you where you need to go. Your Muster Station can be found on your Key to the World card and is notated by a large letter. Signage will be out to direct you where you need to go. Once you reach your muster station, Cast Members will take roll and then perform a safety demonstration in which they advise you how to use your life preserver and access the life safety boats in the event of an emergency. The drill is mandatory, and Cast Members do take roll to ensure all guests have participated. After the Muster Drill, it’s time to sail away! Disney hosts a great song and dance party on the pool deck with music, dancing, and our favorite characters. 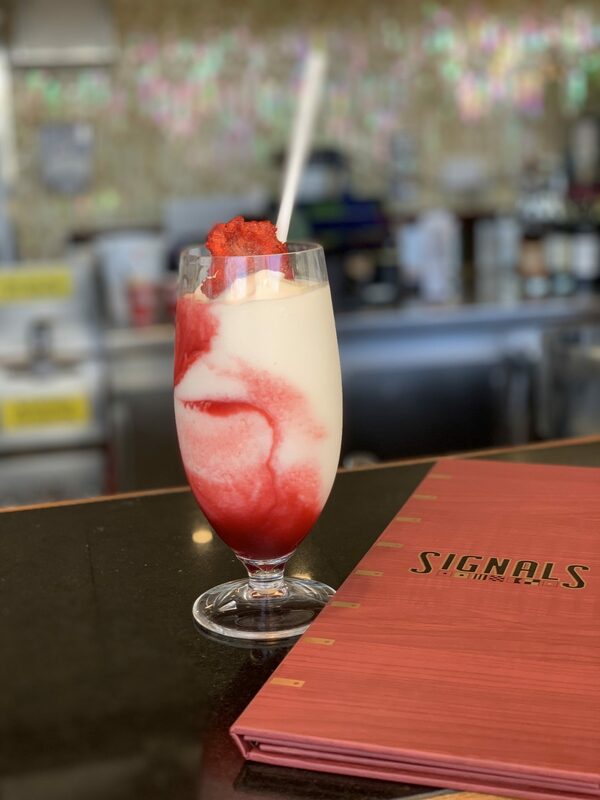 It’s a great way to get in the mood for vacation and wave goodbye to work and school! After the Sail Away Party, you are officially on vacation! 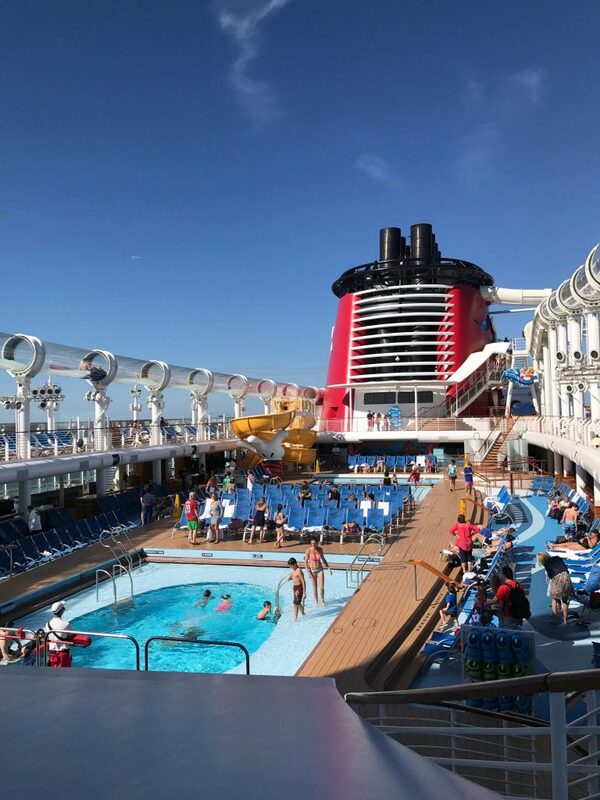 There is so much to see and do both on the Disney Cruise Ship and in Port! Guests 21 years of age and older can bring two bottles of wine or a six pack of beer per stateroom onboard the ship from the departure port only. All alcohol purchased in port will be held until you disembark the ship at the end of your cruise vacation. Can my kids come and go from the kids club? Parents can opt to have children ages 10 and over be able to check in and out of the kids’ clubs. Crew Members will ask you to verify that the kids can check out on their own each time you check them into the club. Can my kids have their own room? No, each room must have an adult 18 years or older booked into the room. However, you can book two adjoining rooms and have the kids share one room and the adults in another like we did on our past cruise. This is the BEST way to sail with the kids if you ask me! What is not allowed on board the ship? There are changes and updates regularly. It’s best to visit the Disney Cruise Line website to get the most accurate and up to date information. Standard items like guns, weapons, knives are never allowed. What happens to the items confiscated at check-in? Items that are not allowed on board but are brought to the port on embarkation day will be held at the port until you return. How long should I sail? I love a 3 or 4-day weekend getaway but that being said I’m an Orlando local and don’t have the added expense of plane tickets, hotel rooms, and transfers to think about. For guests who do have all of those additional items to pay for, I would consider sailing for seven nights. I promise it won’t be too long! You probably still won’t want to get off the ship when it’s over! 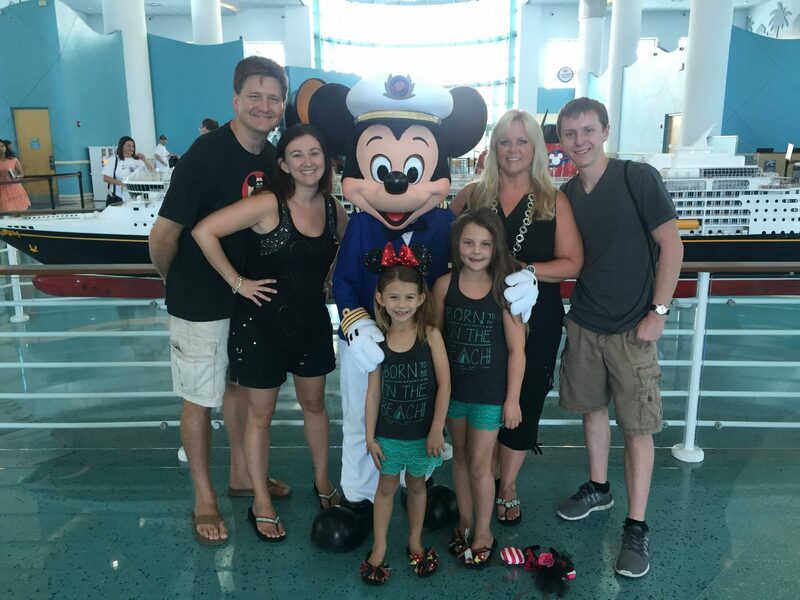 Why Disney over any other cruise line? For so many reasons! I’m not sure I can even list them all here! 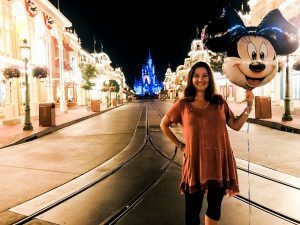 If you know and love the magic of Disney, I probably don’t even have to answer this question, but if you’re on the fence about it all we need to chat in person! It’s just too much to type! 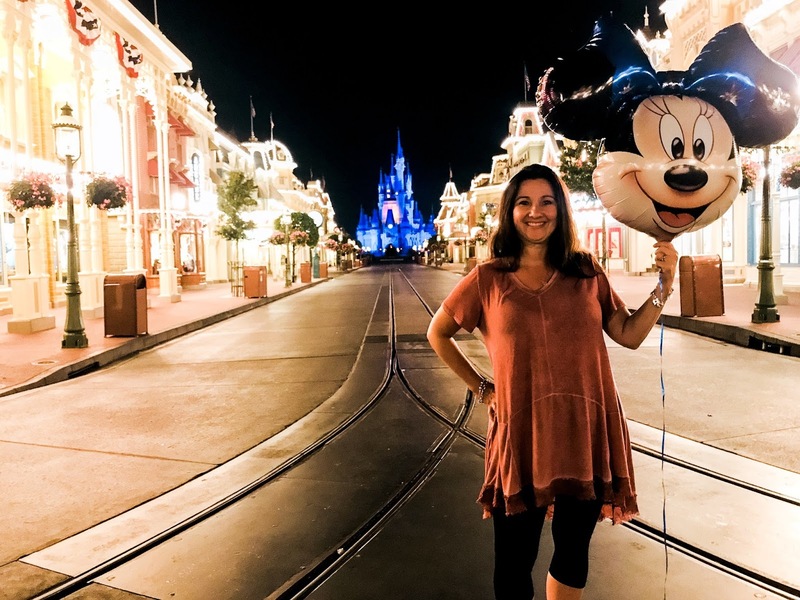 I’d love to tell you why Disney Cruise over all of the others… reach out, let’s chat! 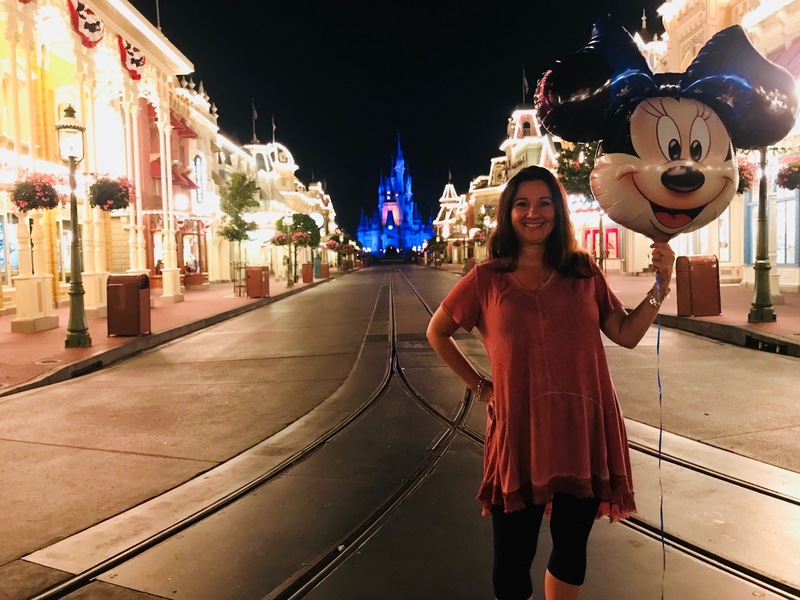 Do you have more questions about planning your Disney Cruise vacation? Or need a free quote! I”m happy to help! Email me at hello@LOTMV.com or find me on Facebook and Instagram and reach out!